Terror victims' group calls on the government to keep its promise, keep Shalit deal terrorists who re-offended in jail. Following a call from several self-described human rights organizations for Israel to consider releasing many Palestinian Authority (PA) terrorists, the Almagor organization for victims of terrorism has issued its own call demanding that the government keep terrorists in prison. The government must “keep its promise to terror victims and to the Israeli public that it would send terrorists released in the Shalit deal back to prison immediately if they returned to terrorism,” said Almagor head Meir Indor. 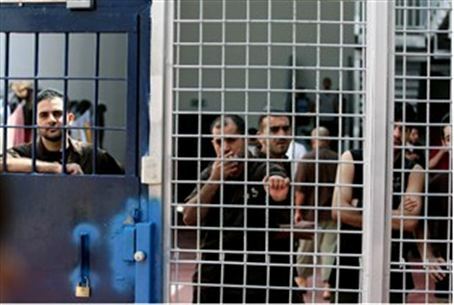 Several PA terrorists in Israeli prisons are hunger striking in an attempt to force the Prison Service to release them. Among them are some who were re-arrested in recent weeks after being released in exchange for captive IDF soldier Gilad Shalit. Among the most prominent is Hana Shalbi, an Islamic Jihad terrorist from the village of Burkin near Jenin. Shalbi was arrested recently based on “completely certain” intelligence that she had assisted in planning a terrorist attack that was to involve kidnapping an IDF soldier. She had been released in the Shalit deal just months earlier. “Human rights” groups including the PA organizations Al-Haq and Addameer (Prisoner Support and Human Rights Association) and the Israeli group Physicians for Human Rights – Israel have called for Shalbi to be transferred immediately from prison to a hospital, and for the world to pressure Israel to stop using administrative detention. Administrative detention allows the IDF to arrest terror suspects immediately, and to gather sufficient evidence for trial afterward.